The weather has turned colder and we have had a few days with frozen ground. 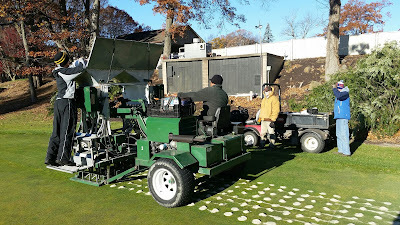 We are preparing the greens for winter. All the greens have been aerified and plant protectants were applied yesterday. Today we are starting to apply our protective sand coating. 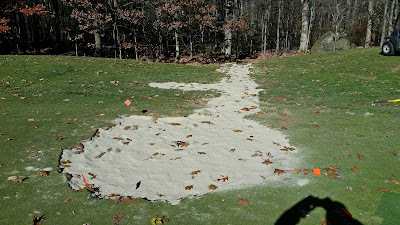 Once a green has had the heavy layer of sand topdressing applied, it is closed for the season. 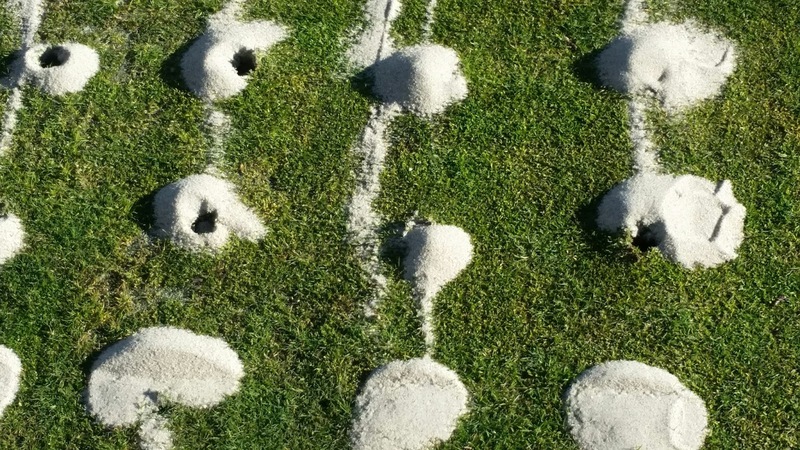 Those holes will have temporary greens until Spring. We are trying to do as much as possible before the forecasted heavy rain hits today and tomorrow. 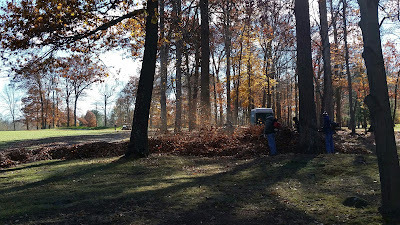 We spent some time cleaning the wooded area between holes number twelve and fourteen. 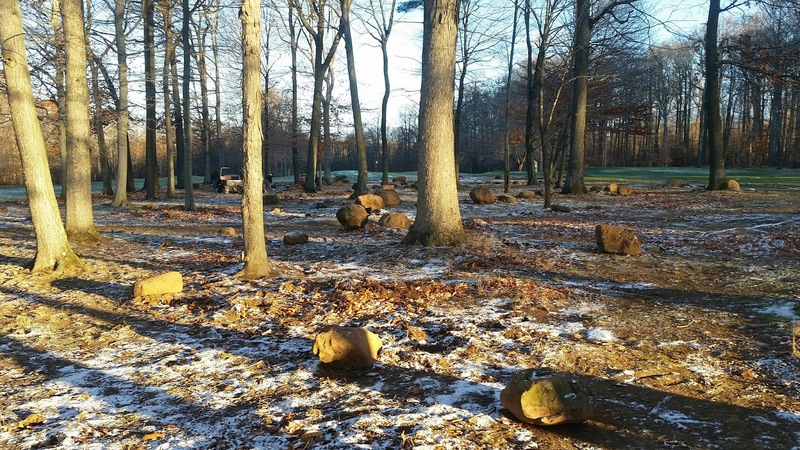 We have removed many large rocks to allow the maintenance staff to be more efficient maintaining the area throughout the season. Larger equipment can be used instead of excessive hand labor. Staff using backpack blowers to move leaves is not efficient. 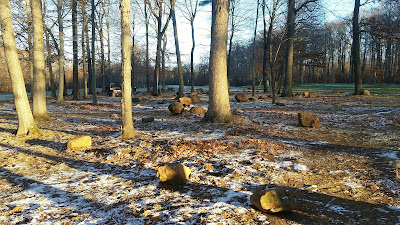 Many large, protruding rocks being removed from ground. Rocks hauled away and scrap sand used to fill the holes. Selective problem trees to be removed. We are doing drill and fill aerification on a few greens today. 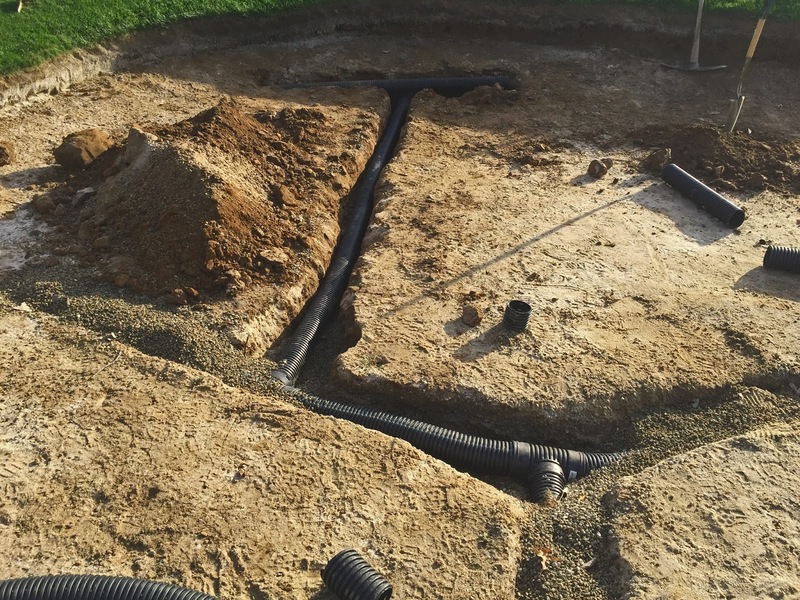 This process will help with drainage and the relief of soil compaction. We are only doing a couple of the more problem greens. 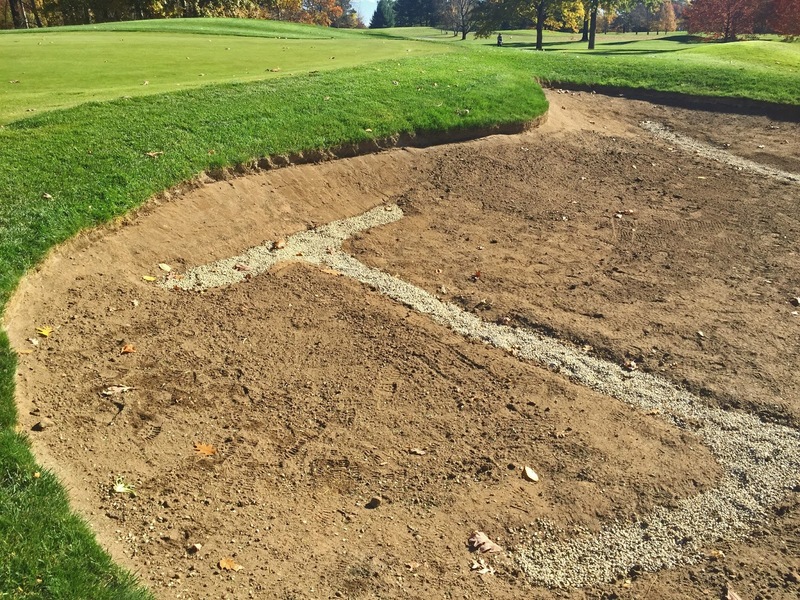 Hole spacing will vary dependent upon soil conditions. 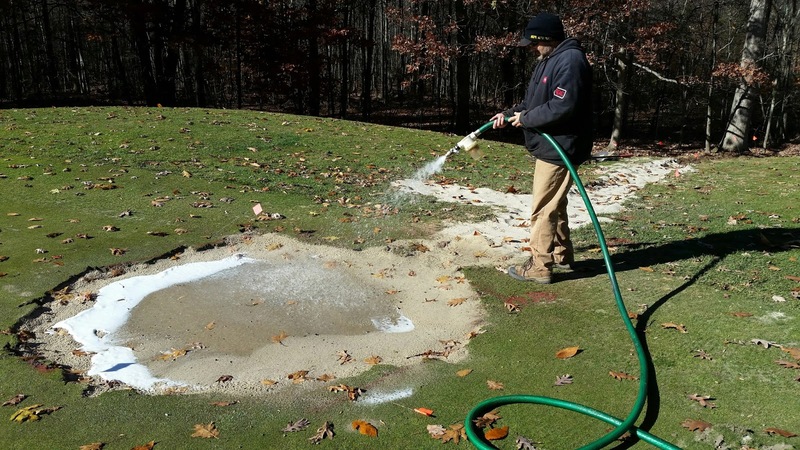 Tighter spacing will be used in areas that have the worst drainage. 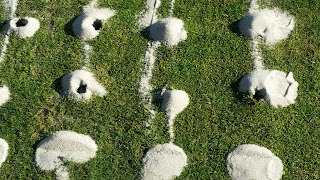 The machine drills a hole then fills it with sand as seen below. Maintenance staff fills the hopper with kiln dried sand. The sand must be completely dry so it does not clog the delivery tubes. We continue to tackle some problem areas on the course. There is a small area on the back of twelve green that never drains and the turf quality always suffers. We decided to spend time installing some drainage using leftover supplies from previous projects. Solve the problem instead of constantly "band-aiding" the area. Once the topmix has settled we will install sod we strip from our nursery. 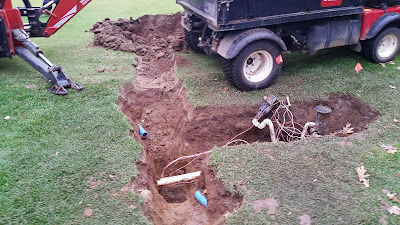 Fix irrigation heads in conjunction with drainage. Install pipe and pea stone. Water heavily to aid compaction. 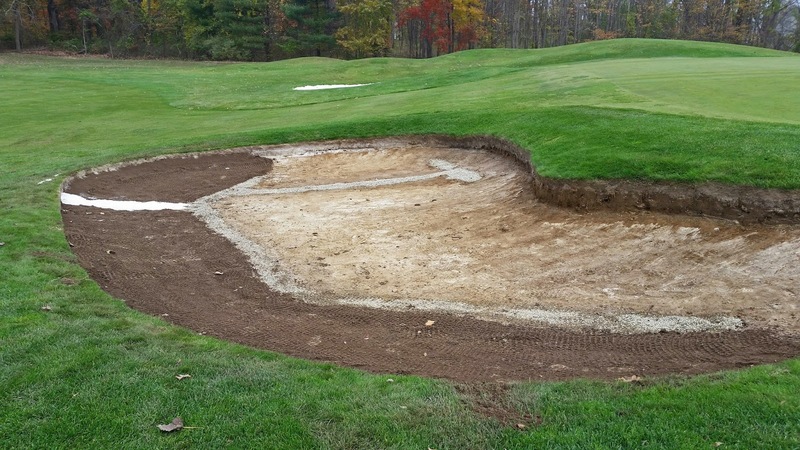 Here is the latest USGA Northeast regional report. Take the time to stay informed about what is happening in our area. Always a good read! Finishing fall projects, managing frost delays and cleaning up leaves are all part of the challenge of golf course maintenance during fall. Playing a round of golf in late fall can be a real treat. Brisk air, vibrant colors and healthy turf are all conducive to enjoyable golf. Late-season warming trends have also added to the fall golf experience this year. However, Frost Delays are also part of fall golf and they require patience and cooperation from golfers to avoid unnecessary turf damage. Even on relatively warm days, early morning frost is still possible. 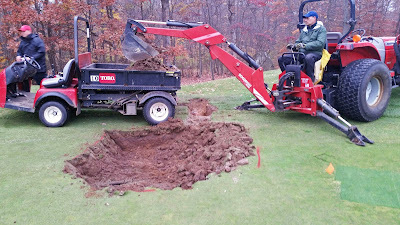 For golf course superintendents, balancing maintenance operations with fall projects can be quite tricky. Fewer rounds played each day means there is an opportunity to perform golf course improvement projects with minimal golfer disruption. However, maintenance teams still must perform the arduous task of leaf cleanup while maintaining the golf course for fall play. Once a project begins, superintendents know that the race is on to beat early winter snowfall. In some cases, staff members must be reassigned from maintenance tasks, such as leaf cleanup, to help with a project. · Carefully document the cost of leaf removal. Cost analysis should include labor hours, fuel cost and equipment maintenance costs. 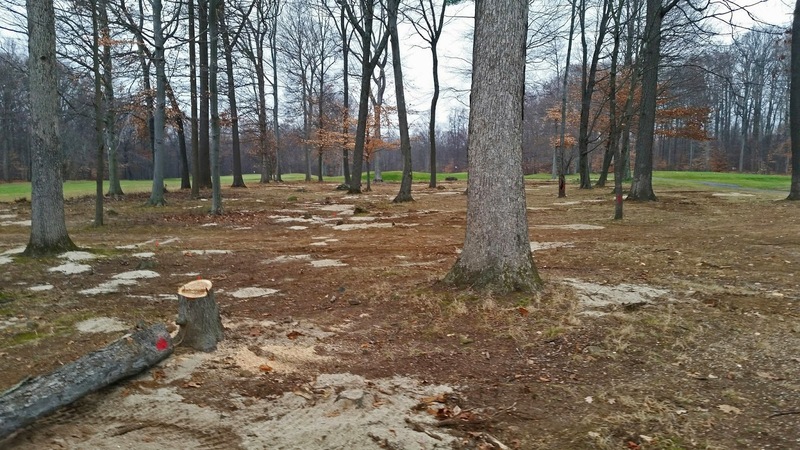 Few budgets include the cost of leaf removal as part of a tree budget, but they should because it is important for golfers to know the full cost of trees. · Evaluate the trees on the golf course and determine which are worth the extra labor and expense they entail. The costs may be worthwhile for good-quality trees; but if trees are unhealthy or causing agronomic problems, it might be worth enduring the one-time cost of removing them to reduce long-term maintenance costs. Combining leaf removal with the other Hidden Cost Of Trees can make selective tree removals easy to justify. 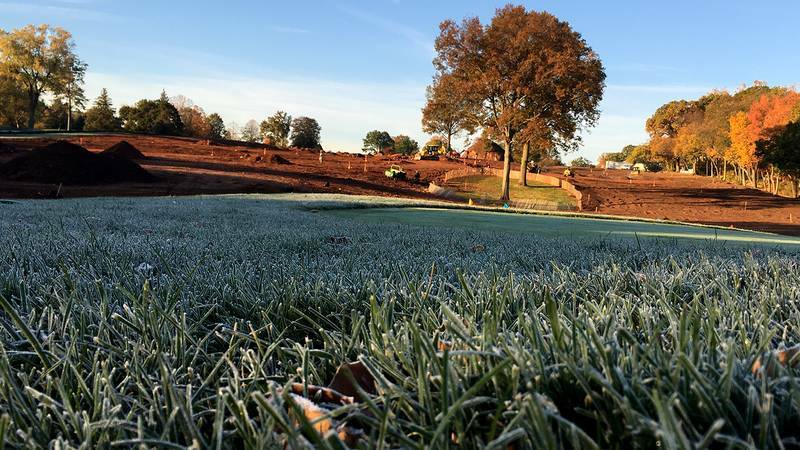 Removing low-quality or poorly placed trees can improve turf health and performance during the summer and reduce cleanup costs during fall. 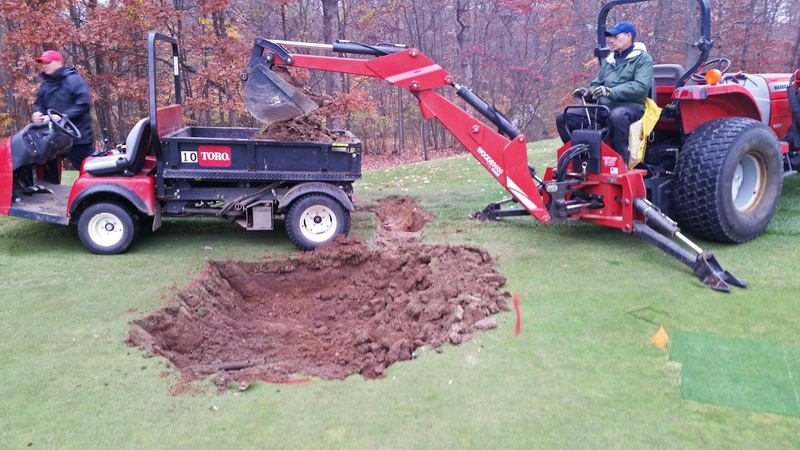 Maintenance departments often operate with fewer staff members during fall, making it challenging to keep up with course maintenance and fall projects. 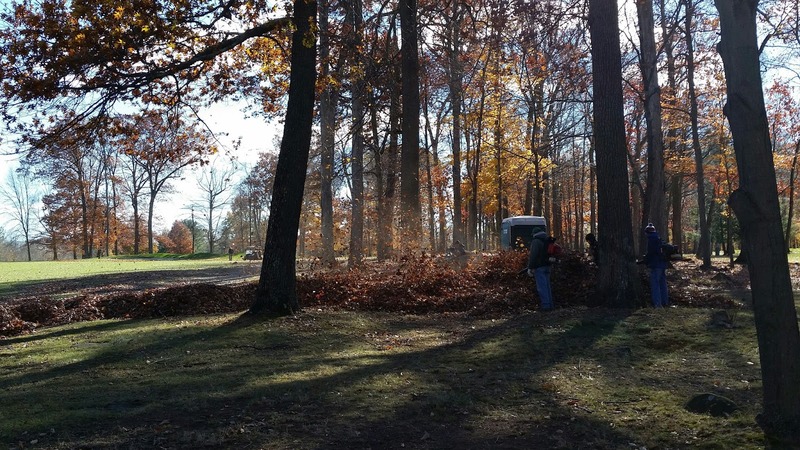 As golfers race to enjoy their last few rounds of the year, remember that maintenance teams are also racing to clean up leaves, maintain the course and finish fall projects. Frosty mornings are a great time to work on trees in areas where it won't reduce our efficiency during fall cleanup! 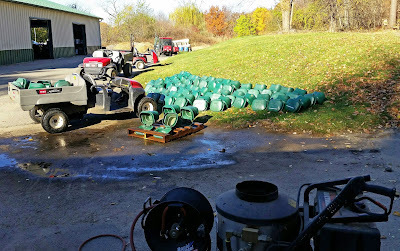 Some course supplies being brought in and cleaned for winter storage! 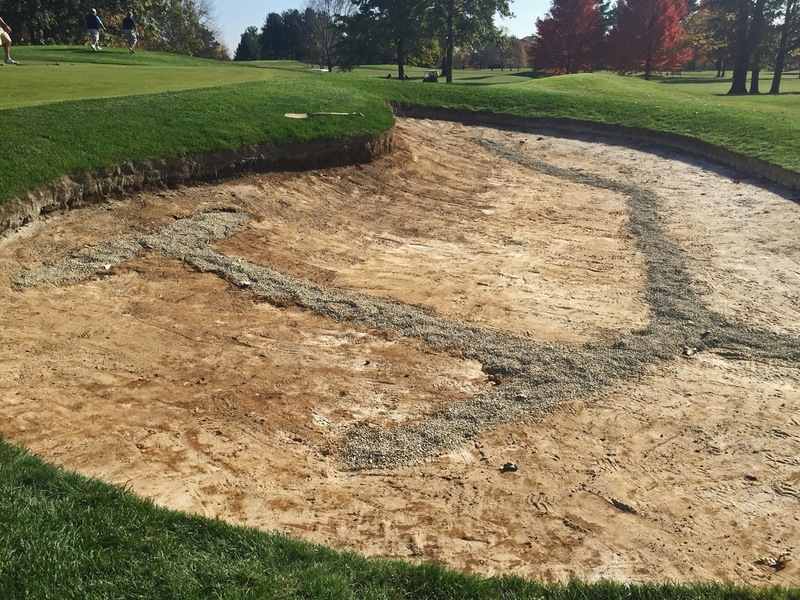 Bunker Renovation At 14 Green Progressing Nicely! The right greenside bunker renovation on hole 14 is progressing nicely. 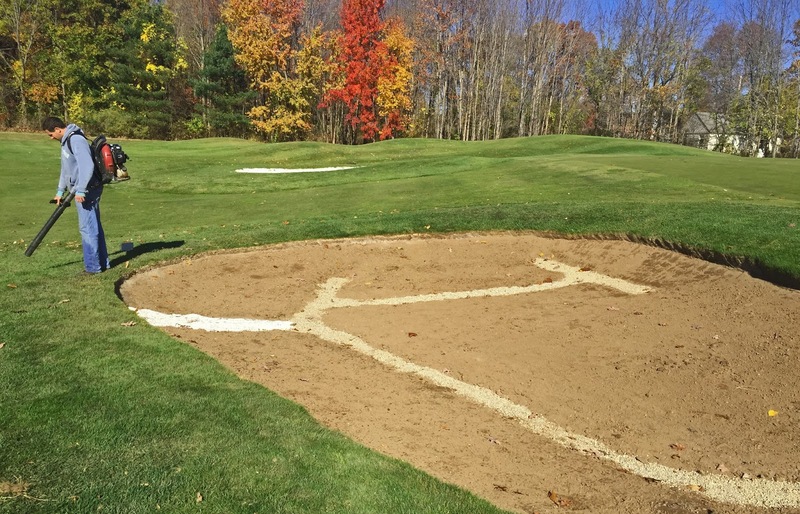 Assistant Superintendent Chris Berry did a great job running this project! We removed the old sand and fabric. Step two was the repairs to the drainage system. We also added some new pipe to the left side to reduce potential washouts during heavy rain events. The third step was the addition of screened topsoil to re-contour the base and get prepared for the sod which will be installed next week. 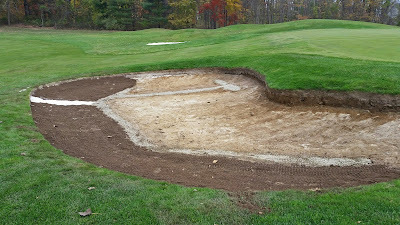 "Bunker Renovation On Hole 14 Complete"
Obviously the bunker is being played as Ground Under Repair until Spring completion. 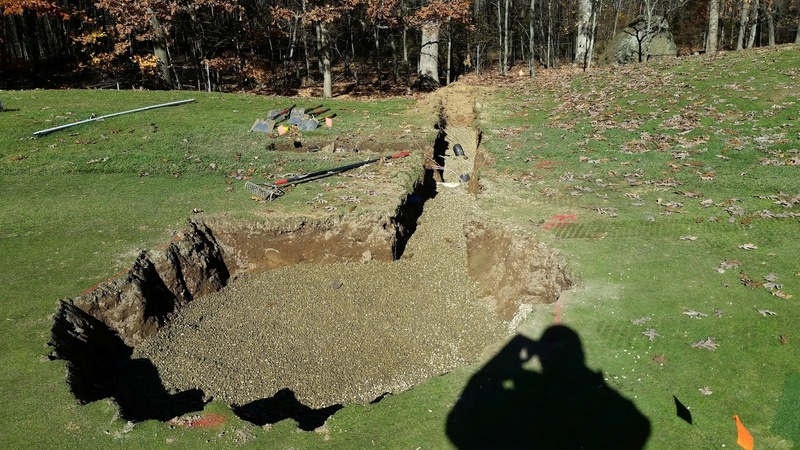 Pipe repairs and additional section installed to catch extra flow which enters the bunker during heavy rain events. Drains complete and ready to begin adding topsoil. Notice how steep the greenside lip is in this photo. Base complete and ready for sod. Notice the reduction in the "lip" height on the greenside edge!